As the stars have just given me a half decent showing in La France I thought I’d share a quick note on one of the prominent constellations in the Northern hemisphere throughout the winter. Orion is linked, as many of the great constellations, to Greek mythology. Orion is believed to be a once mighty hunter, so large that it was said he could kill any animal on earth. As fate would have it he was killed by one of the smallest, a scorpion crawled out of a hole and stung him on his foot. The gods then took pity on him and brought him back to life and placed him in the stars for ever. Orion was in love with Pleiades (‘The Seven Sisters’ or ‘nymphs’ daughters of the sea god Neptune) who he can be seen pursuing across the night sky hoping for their reunion. Orion’s path to his loves is unfortunately blocked by the great bull, Taurus. Orion is seen raising his club in his right hand to ward of the bulls attack. 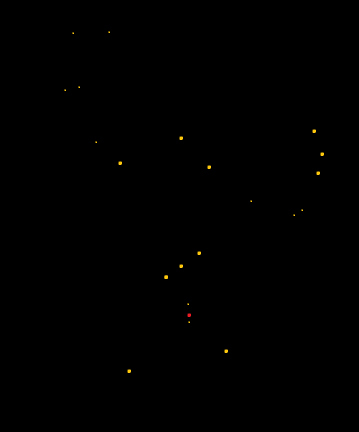 Figure 1: Constellation of Orion. Central red ‘star’ of the sword in the Orion Nebular M42, clearly visible with the naked eye and one of the best examples in the night sky. The classic profile of Orion with his broad shoulders, three jewelled belt with sword attached is one that many people will recognise if not know its name (see figure 1). Unlike much of the constellation the central star of his sword is not actually a star at all but in fact the Orion Nebula. Gaseous Nebulas, such as Orion’s, are areas of new star formation within vast clouds of hydrogen gas. These young stars give off huge amounts of ultra violet light which excites the hydrogen gas around it causing it to glow a pinkish colour. Often stars can be seen as clusters within the centre of theses nebula, which is the case with Orion. The Nebula found in Orion is only the visible part of a much larger Gigantic Interstellar Cloud of gas and dust which covers the entire constellation. This extensive cloud can be detected in infrared wavelengths. Straddling the celestial equator Orion can be seen in full from almost any position on the globe, making it a potentially useful navigational tool in locating other constellations for those who are unfamiliar with southern constellations or struggle to remember each individually. Hope this quick insight into one of our greatest night time spectacles will have inspired you to get out and see what you can find, and if not then you can simply wait for the next exciting installment, or even better join us on the woodland ways weekend during these colder months for a better view and a clear explanation of the night sky!